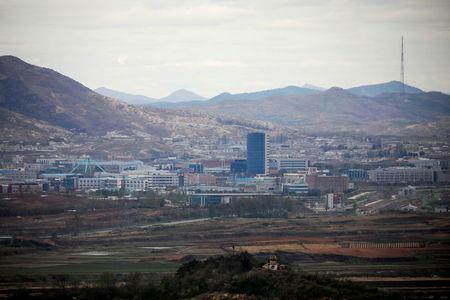 The liaison office in Kaesong, North Korea, was opened in September, a key development in the past year of North-South detente. North Korea's pullout was seen as a setback for South Korean President Moon Jae-in's attempts to engage with Pyongyang. South Korea's Unification Ministry said some North Korean staff members were working at the liaison office on Monday and the two sides held a consultation. It quoted North Korean staff members as saying "we came to do our shift as usual." South Korea's Yonhap news agency said four or five North Korean officials came to the office, about half the usual number, but none of the more senior officials showed up. Analysts said the North Korean move probably reflected Pyongyang's satisfaction with Trump's decision to hold off on new sanctions. They said last week's pullout appeared aimed at pressuring Seoul to persuade Washington to soft-pedal on sanctions. Japan's Kyodo news agency quoted a diplomatic source as saying that Biegun's visit may include talks with Chinese Vice Foreign Minister Kong Xuanyou. The State Department declined to comment on Biegun's schedule. U.S. Secretary of State Mike Pompeo said on March 4 he was hopeful he could send a team to North Korea "in the next couple of weeks," but there has been no sign of a North Korean willingness to extend such an invitation. Separately, Russia's RIA news agency quoted a Russian lawmaker as saying on Monday that North Korean leader Kim Jong Un will visit Russia for talks this spring or summer. The Kremlin confirmed a trip was being worked on but said that it was not able to provide further details. Last month's Trump-Kim summit collapsed over North Korean demands for sanctions relief and U.S. demands that North Korea give up its nuclear weapons. China said last year that Beijing, Moscow and Pyongyang believed it was necessary to consider adjusting U.N. sanctions at an appropriate time.